Mumbai, April 4 (IANS) Will Smith has ticked off Bollywood from his bucket list, says filmmaker Karan Johar in whose production "Student Of The Year 2" the Hollywood star has shaken a leg to the song "Radha teri chunari". New York, April 4 (IANS) Rishi Kapoor looked in happy spirits as he was joined by his wife Neetu and their son Ranbir in New York where the veteran actor is recuperating from an ailment. Mumbai, April 4 (IANS) Shah Rukh Khan's daughter Suhana Khan and Chunkey Panday's daughter Ananya Panday are often seen hanging out with each other, but their recent outing is giving some major best friend goals. Mumbai, April 4 (IANS) Actress Huma Qureshi says she is addicted to the physical training that she began when she started shooting for the Netflix series "Leila", which she is excited about it. 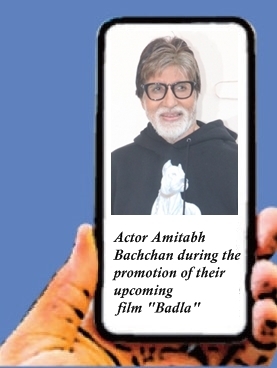 Chennai, April 4 (IANS) Megastar Amitabh Bachchan, who is all set to make his Tamil debut with "Uyarntha Manithan", has called himself a disciple of late southern superstar Sivaji Ganesan. Mumbai, April 3 (IANS) Actor Saqib Saleem says he is thankful to his mother for helping him be independent and for preparing him to face the world. In an emotional note, Saqib penned how he is grateful to her for her unconditional support. Mumbai, April 2 (IANS) What could have been an innocent move has landed Boney Kapoor in the midst of a controversy. Mumbai, April 2 (IANS) Actress Soha Ali Khan says her two-year-old adorable daughter Inaaya Naumi Kemmu is very naughty and active kid, and she feels her daughter is very similar to her actor husband Kunal Khemu.